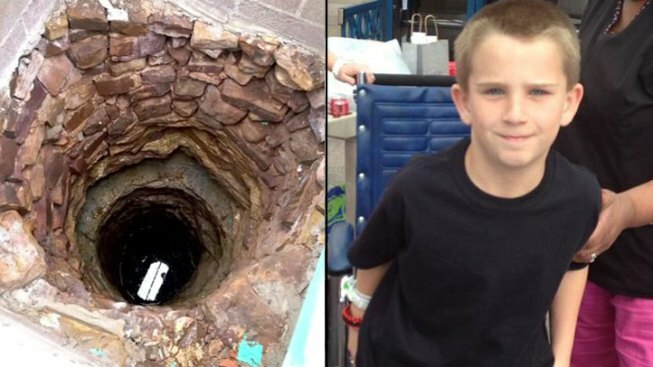 A nine-year-old boy fell 40-feet down a well on a vacant property in Mineral Wells, Texas, on Saturday but was pulled to safety by his “hero” neighbors, his family said. Jaxson Tune suffered head injuries but was released from the hospital on Monday and is talking and walking around, according to family. “All I remember is waking up with one light above me and I was very cold and I didn’t know what was going on,” Tune said of the accident. Shawnee Coomer said Tune and other neighborhood kids were playing in the grass of a home that no one lives in next door, near the Airport Mobile Home Park. While Tune was doing pull-ups on a bar over the well when he fell. "All he remembers is picking flowers and then waking up in the hospital," Coomer said. "He doesn't remember the accident, he doesn't remember falling through." His mother, Teresa Degarmo, was overwhelmed when she got the call about her son Saturday. “Hysterical, that’s about the only way to describe it. Nobody expects to hear leaving work that your son fell into a well,” she said. The family said their neighbors, Joshua Richard and Christopher Hicks, rushed to the well, pulling off the remaining pieces of tin and tile covering the well and then finding a long strap to lower Hicks down. "They helped out a lot, he probably wouldn't be here if it wasn't for them," Coomer said. Hicks said he thought the well was only a foot or two deep, but discovered it was deeper then he is tall. "When I got down there, I was up to here," Hicks said, referring to his chest. Hicks was able to brace himself in the well and pulled Tune onto his lap, while Richard and others used the strap to pull Tune out. "I'm just glad I was able to be around and he was around when we did (act), because there's no telling what would have happened to that little boy," Richard said. A Mineral Wells police officer also went into the well to help get Hicks out. The family and many other neighbors consider Hicks to be a hero. Tune suffered a fractured scull and was taken to Palo Pinto General Hospital and then transferred to Cook Children's Medical Center in Fort Worth. He had surgery to relieve the pressure from that injury, but it went so well he was released from the hospital just before 5 p.m. Monday, family said. “I feel great since I get to go home. I get to sleep in my own bed again,” Tune said outside the hospital Monday. Tune and his mother are both thanking everyone who saved the boy's life. “'Thank you'’, is all I can say. Very blessed, very blessed. Don’t know what we would have done if they wouldn’t have been there,” Degarmo said. NBC 5's Kevin Cokely and Holley Ford contributed to this story.